We’d love your help. Let us know what’s wrong with this preview of Tangled Lines by Bonnie J. Doerr. A string of islands, a knot of criminals, and two teens to untie it. High school changes everything for Kenzie Ryan and Angelo Sanchez—especially their relationship. After spending all summer cracking crimes against endangered wildlife in Big Pine Key, Florida, now they barely see each other. Angelo hangs out with a Porsche-driving quarterback and a stunning local “Conch pr A string of islands, a knot of criminals, and two teens to untie it. "Tangled Lines is loaded with irresistible heart-stopping adventure. This fiction-based-on-fact eco-novel is an engaging portrayal of teens with a passion for saving threatened pelicans. They have no doubt they can change their world, and almost no fear of attempting anything to achieve their goals. A perfect tool for connecting teens with birds and avian issues, we will be adding this book to our Audubon library to inspire this age group." "Bonnie J. Doerr's Tangles Lines transports readers deep into the wildness of the Florida Keys in vivid reality. This environmental mystery's teen detectives' relationship troubles and dedication to saving the magnificent creatures they share their world with will hook readers until the very last line." To ask other readers questions about Tangled Lines, please sign up. Bonnie J. Doerr has written a polished, exciting and important book. 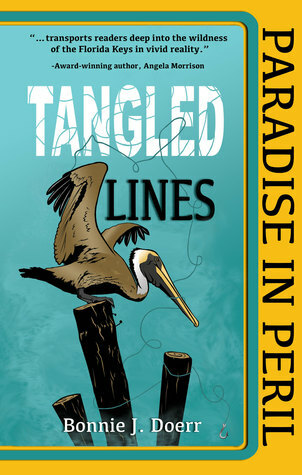 Tangled Lines deals with the destruction of natural habitat and cruelty toward pelicans, all in the name of profit. Doerr’s research is impeccable. The portrayal of the culture and community of Big Pine Key, Florida is realistic and believable. The reader is given an insight into the daily struggle of fishermen, the risks taken by Cuban immigrants to reach the United States of America, exploitation of the natural world, the sen Bonnie J. Doerr has written a polished, exciting and important book. Tangled Lines deals with the destruction of natural habitat and cruelty toward pelicans, all in the name of profit. Doerr’s research is impeccable. The portrayal of the culture and community of Big Pine Key, Florida is realistic and believable. The reader is given an insight into the daily struggle of fishermen, the risks taken by Cuban immigrants to reach the United States of America, exploitation of the natural world, the senseless slaughter of wild creatures, and the courageous and giving nature of volunteers trying to protect endangered wildlife and the environment. As well as a fascinating glimpse into this world, the author creates a realistic and touching story of unrequited love. Kenzie Ryan, the hero, has developed romantic feelings for her comrade in environmental protection but he, Angelo Sanchez, just wants to be friends. In turn, Angelo has fallen for a wealthy and beautiful girl from an influential family who also happens to be a good person. There is also a budding romance between Kenzie’s friend Ana and an older boy, who seems oblivious to her wheelchair. The complications and emotions of teenagers in relationships is shown with tact, understanding, empathy, and a sense of humor. This book is an “eco-mystery”. As such, clues are given as the true reason behind the slaughter of pelicans unfolds. Kenzie and Angelo take great personal risk in order to protect the vulnerable animals. The suspense escalates to a satisfying climax wherein some people are showing to be worse than anticipated and some are shown to be better. This book was 400 pages, but it flew by quickly. The editing was perfect. The pace was comfortable. The characters were likable and made us care about their future. The mystery was educational and worthy of our attention and time. Although this book is written for middle grade children, young adults and adults would find it interesting and enjoyable. Highly recommended. With the publication of TANGLED LINES (Seek, 2016), Bonnie Doerr completes her eco-mystery series that began with ISLAND STING (2010) and STAKEOUT (2012). All three middle grade books star "detectives" Kenzie Ryan and Angelo Sanchez figuring out an ecological crime that threatens their beloved Florida Keys. Since I frequently interweave book reviews with comments on craft, this review will focus on three basic elements: The Beginning, Middle, and End using materials Barbara O' Connor provided at With the publication of TANGLED LINES (Seek, 2016), Bonnie Doerr completes her eco-mystery series that began with ISLAND STING (2010) and STAKEOUT (2012). All three middle grade books star "detectives" Kenzie Ryan and Angelo Sanchez figuring out an ecological crime that threatens their beloved Florida Keys. Since I frequently interweave book reviews with comments on craft, this review will focus on three basic elements: The Beginning, Middle, and End using materials Barbara O' Connor provided at the fall SCBWI-Carolinas regional conference. In the first two pages of TANGLED the reader finds Kenzie gathering Florida Keys' newspapers and shoving them in the recycling bin under her stilt house. As she performs this chore, she sees a picture of a Brown Pelican. Within a few pages Doerr has shown that Kenzie's story is set in the Florida Keys. Even without the cover and book illustrations, readers will guess that environmentally-sensitive Kenzie's new mission is to save injured pelicans. Kenzie's quick call to action sets the tone for the book. O' Connor said that the setup should contain the catalyst (the event or action that starts the story) as well as a central question (what the problem is.) Do you see those elements in these brief snippets from TANGLED LINES? O' Connor mentioned that the setup should include relevant backstory. Doerr expertly intertwines the right amount of details from the previous two books without bogging down TANGLED. As Kenzie tries to find out who is hurting the pelicans, she turns to her Cuban-American friend Angelo Sanchez, who helped her solve previous eco-mysteries. But they've entered high school and things have changed between them. Angelo is spending time with a different girl (Estefania) and there's another guy who Kenzie thinks about. Complications ensue! and contain action that revolves around the central question or problem. Kenzie talks to her friend Ana about Angelo's lack of figuring out who is harming the pelicans. Ana reminds Kenzie that Angelo's father's business depends on selling fish caught by local fisherman. Kenzie determined that the birds were often injured by fishermen because the birds stole their bait and snatched their catch. "Oh my gosh. I almost forgot to tell you. Donna at the Wildlife Center started keeping a chart of mile marker sections were injured pelicans are found. You'll never guess where they've found the most." He was almost afraid to ask. "Where?" Answers the central question or solves the problem raised in the setup and happen just before the resolution. I can't tell you how Doerr weaves together all the story lines, because I don't want to spoil this book for you. Let's just say there is high adventure on open water (including a kidnapping and an almost-concussion), Kenzie and Angelo capture the bad guy, the pelicans AND island are saved, and a sweet romance create the perfect ending. But since this is the last book in the series, I'll share this snippet. Angelo fixes Kenzie's broken necklace and with trembling hands clasps it around her neck. Angelo lifted the key pendant. "I'm sure glad your mom got this for you. Wish I could have bought it, though." His voice cracked. He hesitated, cleared his throat and continued. "Remember why I wanted you to have it?" He made it sound like the right answer would be the key to solving a mystery, but a wrong answer would further complicate it. Like he was navigating uncharted waters. Kenzie had no clue. They were in such a comfortable place with each other now. What would happen when she admitted it? She tensed and gulped, "No." I challenge you to read TANGLED and figure out how many story lines are tangled and then untangled by the end of the book. I counted at least four. How many will you find? I won't write much of a review as the author is a friend. Also, it is young adult fiction, a category I rarely read so have little experience with. But, it certainly made me want to return to Key West. Especially as I read it today, we have almost 8 inches of snow on the ground and a deep freeze is headed our way with lows in the single digits! Kidlit author. I observe. I read. I write. I dig. I pull. I plod. I need wide open spaces. Room to make my big mistakes. And if I can't be a good example, I'll just have to be a dire warning.